This month I’ve been sharing posts and interviews as related to Blogging Brilliance and training in the area of blogging so as to bring God the glory. 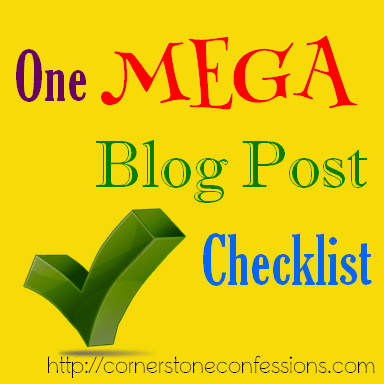 Today’s post marks the end of the Blogging Brilliance series and as such I am concluding the series by sharing one MEGA blog post checklist printable. Feel free to print, save, share, and use this printable to your heart’s content. In it you will find everything from preparing your post for SEO to social media shares and more. Did I leave something out? Shoot me an email. I’ll add it to the list and send you an updated copy, free of charge. Happy posting! This post is the 12th of 12 in the 144 Plan to Blogging Brilliance. To learn more about the 144 Plan or catch up on a missed post, check out the complete 144 Plan Training Log. I am gonna have to catch up on your series…cuz I just spent the last couple weeks designing my new blog site. This checklist is going to be laminated and marked off when I prepare a new post, believe me! Thanks so much for sharing. If you have time, I’d love if you’d check out my blog. I only have 2 posts published *who-hoo*…but maybe you’ll have some tips on what I could/should add, etc before I get too far along. I love your Jesus heart and enjoy what I’m seeing on your blog. So much more to explore here! Love your blog layout. So clean and cute. Love it. The only thing I would be conscientious about might be the social media buttons. While it is popular to customize your buttons so they look cute and match your blog design,new social media guidelines for most social media networks actually makes this illegal. For instance, I used to have some cute flower social media buttons on Cornerstone Confessions until I started reading these guidelines (from Facebook, and G+ and the like…) and learned that getting your logo from any place besides the actually social media site is not legit. While I doubt they will do anything about it for awhile this may be something you want to be aware of and consider. I wish we could keep it cute but I’d rather keep it safe if you know what I mean. Glad you found this printable helpful. AND, glad you to see you here. Your blog is off to a great start! I hope you will share what you have already on Titus 2 Tuesday because I think it’s great! I love reading all of your posts in this seri. Thank you very much. Kathy – you are featured this week on Busy Monday! thanks for sharing this very helpful checklist! Pinned. I have really appreciated this series because it has been so helpful to me! I’ve implemented a number of things you’ve posted with success and there are others waiting in the wings. Hope you have a great week! Thanks Charlene! How exciting! So glad to here it’s helped. Thanks for sharing! Have a great week. This is a heck of a checklist! Some things that aren’t on mine! Thanks I’ll be adding to my master list now!